Hugh Bowman believes Performer is one of the best chances he has ever had of winning the $3.5m Longines Golden Slipper (1200m), a race which has so far eluded the champion hoop. By his admission, it’s been a decade since Bowman had the same level confidence going into the world’s richest race for two-year-olds, and he ran third beaten by Forensics. “Every year I try to talk myself into thinking I’ve got a winning chance but the reality is my last winning chance would have been Meurice who I rode into third place for Gai Waterhouse in 2007. It’s exciting going into the race with a genuine top contender,” Bowman said. Bowman put Winx through her paces this week but hasn’t sat on Performer since he sensationally dumped Bowman in the Todman Stakes. That prompted Racing NSW stewards force the colt to trial before racing again. “I’m looking forward to being reunited with him. I was very impressed with his trial. He had the blinkers on. My gut feel is they would have gone on anyways for the Golden Slipper regardless of what happened in the Todman. He is an exciting colt and has given me a great deal of confidence since the first time I sat on him,” he said. 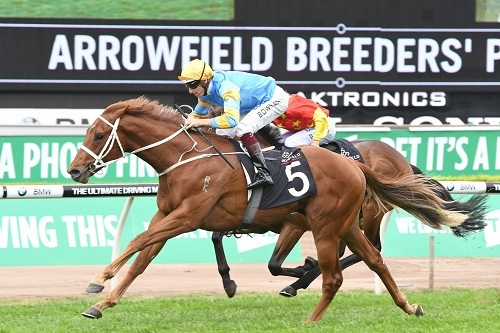 Where Performer would have finished in the Todman Stakes has been keenly debated, with the sectional breakdown on Punters’ Intel revealing the Exceed And Excel colt was just starting to warm into his work. “I think he would have gone very close to winning. I’m not suggesting he was definitely going to win but I would say he would’ve either just won or been beaten neck or less. That’s my gut feeling but I guess we’ll never know,” Bowman said. Make up your own mind - would Performer have won? “He is a quality horse and reacted to something the other day. That doesn’t concern me. It wasn’t as if he shied. Something upset him, whether it was my riding, I don’t know what it was really. I just don’t expect him to do it again. Performer is currently $9.50 with TAB Fixed Odds for the Golden Slipper.